My dear friend Barb, posted a tutorial on using a Honey Bun to make a table runner. Actually that takes you to her blog with a link to where she posted the tutorial. Don't worry, it is easy to find. 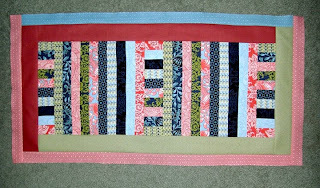 So here is my top for the table runner. I am probably going to add the fusible applique in some fashion. I am sure I will change it up a bit - Just like I did on this. I wanted to make the borders a little wider, so I grabbed a couple of leftover jelly roll strips from another line, in another brand, and did the inner borders a bit wider. I must say that the colors really worked well with the Neptune. This isn't as unsquare as it looks in this picture. I really need a design wall to put things on to photograph. Laying it on the floor and trying to get a shot that isn't skewed --well it just doesn't work all that well. Barb appliqued flowers and hearts on hers, any suggestions what I might applique on mine? The quilt I made for "Quilts for Kids" is finished. So I am posting a few pictures of it. 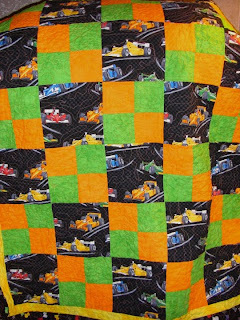 I tried to quilt around the cars in most of the car blocks. Then I did a little bit of writing with my free motion quilting. 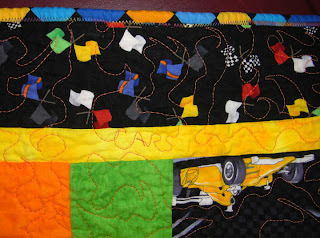 On one end I put "Cars" -- Oh and don't you love the binding...it is the same fabric as the backing. 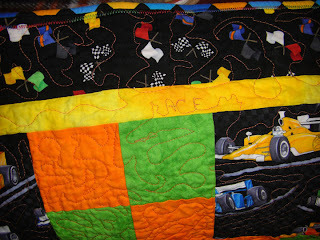 On the other end, "Race"
Finally, a picture of the quilt and a close up of some of my free motion stitching. I hope this quilt goes to a child that will truly enjoy it and feel the love that I put into it. I named it "The Winning Team" in hopes that it would give the child a boost in morale. 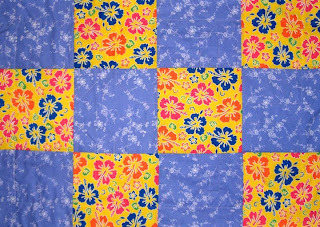 I have been sewing on the Quilts For kids quilt that I blogged about here- LINK and working. I haven't had anything great to post about. (sorry!) I promise to have a great -or at least better than this one- post before the weekend is through. So do come back now, ya hear? Jandi has moved her blog to blogger. She is giving away at least two prizes. I have to say, I would love to win either of them! You can get three chances to win. 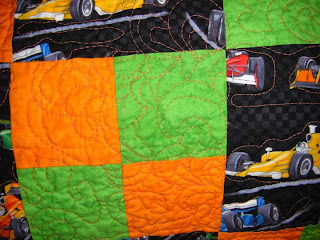 Now my dear quilters, I told you that I could do this block in five seams. Here is how you do it. Move the strip you cut to the other side of the block. Line up your seams (fabrics right sides together) and sew it back on. (seam four) Are you getting excited yet? Now you have to decide WHICH block will be the center. Cut the side with the OTHER full block in half. Move the strip to the other side. Put fabrics right sides together and sew --YES this is seam FIVE!!!! Iron your block nice and flat, trim off any wonky bits to make it nice and square. AHHH.... now wasn't that easy. The truth is, I was trying to take a four patch and make something cool like the disappearing nine patch when I discovered this. Now you know why I didn't know the name of the block - and dear hearts, with all your help, I still don't know. It is a "Puss in a corner, sheep fold, City block, variation on a nine patch" block! Ha ha. Call it whatever you want but do it the easy and fast way! Do I like kids? well.......the fact is that I do. Some of them annoy the bejeebers out of me, but I do like kids. So when I read on Quilt Hollow's blog about the Downy Quilts for Kids Program. I was curious. I went to the site http://www.quiltsforkids.org/ read a while and cried a while. Then I signed up. I got my package of supplies today. The package has the fabric to make the quilt - even the backing, a pattern (((YIKES I have to follow the pattern! ...and you know me and patterns))) and a label to put on the quilt. Here is a picture of the fabric. Do you see those colors? I feel like they picked it just for me. I suspect that a little boy will get this since it is race cars -- but who knows, some little girl with a love of cars may get it. I hope I find out someday. This project immediately moves to the front of the line for me. 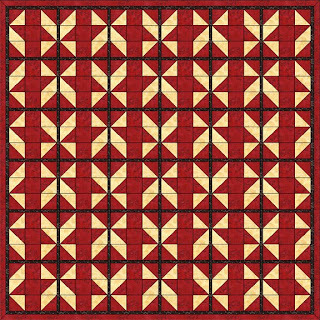 The funny thing is, when I went back to Quilt Hollow's blog I saw that she got very similar fabric but the accent colors are different. The fabric is cut into squares and strips ready to start sewing. I do wish they had left me a little room for creative decisions, but still, I will have fun with this. 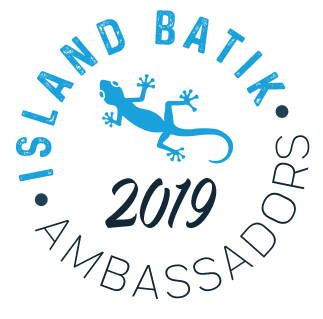 If you are interested, go to the site and check it out. If you sign up, you will have to pay for batting, thread and return shipping of the finished quilt. But as blessed as we are, that is a small thing. and Mary, if you are reading this - Thanks! What is this quilt block called? I searched the internet and couldn't find it. I know it has a name. Now, could you make by stitching only five seams? I was playing around on paper and came up with a method to do this. 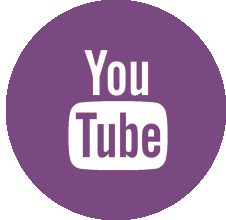 If there is enough interest, I will post a tutorial on it. Everything needs a name doesn't it? A name gives substance, makes real; naming is important. So, I decided to name the two blocks I created when I messed up making a churn dash block. Ha. 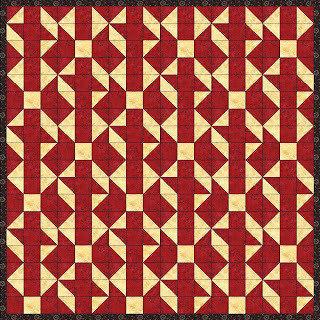 Now, untraditional Gene has designed TWO traditionally pieced blocks! I took the humility blocks and drafted them so I could play with them a little better. I did an alternating layout and I really like it. I tried it with sashing AND without. Then I added a single block version (but with every other block mirror imaged) with sashing. I really like it all three ways. Which do you like better? Do you like either one enough to want to make it? Yesterday I gave you all a good laugh with my Churn Dash block that just wouldn't work out right. This morning I took that lemon and made some lemonade. I give you----(drumroll) The Humility Quilt! Hello, welcome to the day of the humility block. I found a template that let me print out a sheet to make half square triangles(HSTs.) It made several and they were easy to do. Great now, I have all these one and seven-eighths inch HSTs and no plan to use them. What to do? To the internet to see some blocks made with HSTs. 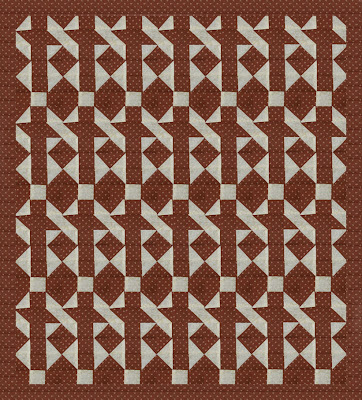 Ooooh here is a nice simple traditional block. It is a classic. I like it too. Great! So I cut out some squares the same size to piece this block. "Can you look at this?" comes a wail from the other room while I am in the middle of piecing it. Okay, I am tending a sick person, so I go to see. I come back and grab the pieces and start sewing again. OOPS, I messed that up. Well, I kinda like it....now I will make another to match it. I start sewing. I looked at the blocks and said "Hmmmph! I guess that traditional piecing just isn't my bag. At least it isn't today." So I joined the two squirrelly blocks and took a picture. Can you guess the block I was going for? Don't feel bad...these look nothing like it. However I think this is cute and interesting enough that I can make something and use it in it. Did you guess yet? I was trying to make a Churn Dash. Pathetic huh? We got a day off due to the snow. Yaay!!! that makes this a four day weekend for me. She was getting rid of some fabric that doesn't go with her current style. So I decided to make a nine patch and see what I could do to change it. I have done the disappearing nine patch already. This block is what I came up with. I think my idea needs work, but I have some thoughts percolating on it. 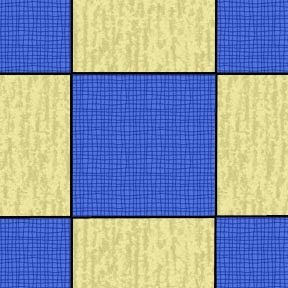 If I had made a second 9-patch with the colors flipped, and mixed up the pieces according to a plan, it would have made the contrasts better. As it is darks joined darks and lights joined lights - not a good plan. Still I like this block. So I ask you, what can I make out of this one??? it is approx 14" by 14"
I also practiced playing my penny whistle. Greg at Flat Out Quilting turned me on to a tune I didn't know yet. It is "The Fields of Athenry"
With the snow arriving, the birds flocked in to the feeder. I couldn't resist sharing this picture of the cardinals. 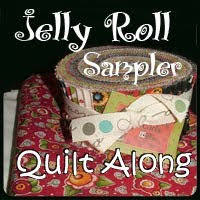 It is call a Jelly Roll Sampler, so you kinda need a Jelly Roll to do it...but hey you could just cut the 2 1/2 inch strips from stuff in your stash if you don't have a jelly roll. 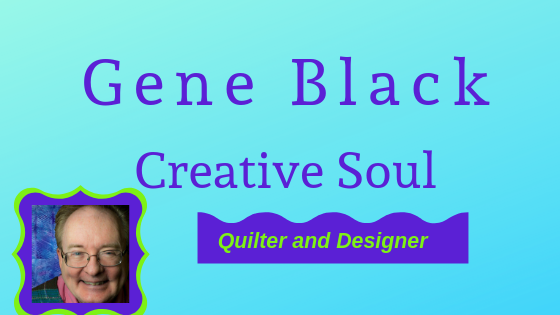 It will be 12" blocks and the finished quilt will be 58" x 72"
A table topper -What is chocolate cake? What a day. I started making a table topper using a quilt as you go method. This was a method I had not used before. I got two blocks done and hated it. - the method that is. The blocks were tossed into the trash can. I had seen a cute topper on Linda's Blog So I decided to 'copy and change' one of hers. What? Me, follow a pattern? Hardly! I try really I do...but well....I can't seem to rein myself in. So, I took some charm squares, some yardage and went at it. Not perfectly square....cause I oop'sed a couple of times. I like it... flaws and all. Oh, but leave a comment for me before you go! Another Finished Quilt and a Movie Recommendation. I have been a little bit lazy lately. I haven't been sewing much. I haven't painted anything. Just lazy! 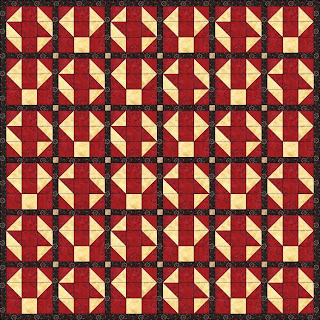 But I did get the inspiration to finish my Ginger jar quilt. I decided to not add any borders but leave it as a smaller quilt. Here is a picture of some of the finished quilt. It was just a top when I started on it again. So this past weekend, I got it layered into the quilt sandwich. This next picture shows the backing. I found this in my stash. I didn't even know I had this piece of fabric. 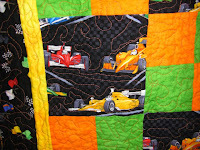 However, it fit so nicely with the background of the front of the quilt that I used it happily. (Yep, a teeny bit of stash-BUSTING) And the binding is a plain caramel colored fabric. -Again from my stash! Here is a confession for you. I love to watch a movie while I am free motion quilting. 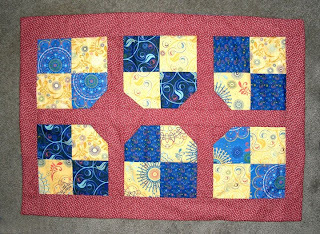 While quilting on this one the movie of choice was "Songcatcher" It stars Janet McTeer, Aiden Quinn, and Emmy Rossum. I had seen it several years ago, but when a friend offered it to me, I jumped at the chance to see it again. As you may guess by the title, it is about music. More specifically, it is about the Scots-Irish music in the Appalachian mountains. As you know I am learning to play the penny whistle. (an instrument directly from that same musical tradition) So you can see how I could love this movie. This movie was mainly a sleeper; most people never even heard of it. It is rich in story and music. I give it a BIG thumbs up.